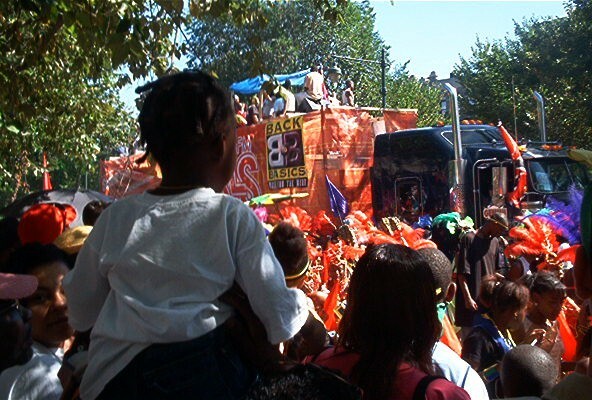 the biggest difference between last weekend's carnival in brooklyn and the carnival in cambridge the week before is the sheer scale of brooklyn's annual west indian festival. 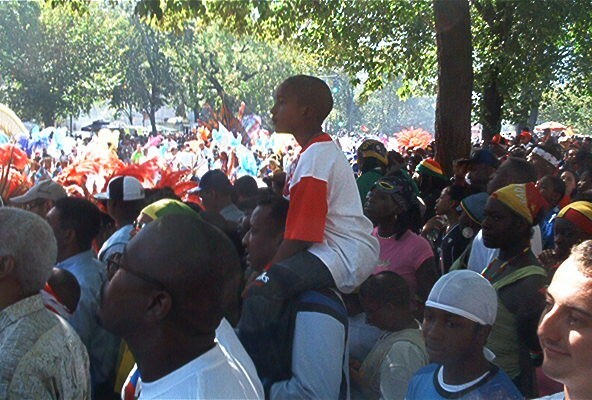 2-3 million people were expected on eastern parkway last monday--apparently 4 mil showed up back in '01--and there were at least many hundreds of thousands there this year. (i haven't been able to find an official count. how does one officially count such a thing anyway?) the multitude included representatives of every island in the caribbean, with folk from the larger islands--jamaica and trinidad in particular--out in force. there was little doubt on this day that the flatbush area of brooklyn is, as selwyn seyfu hinds puts it in gunshots in my cook-up, "the Caribbean capital of the world" (24). at one point the crowd became a bit of a danger to itself. as we were sitting on the curb watching the festival go by, a stampede suddenly materialized, sweeping us off the curb and into the yards of nearby buildings for shelter. it was an intense and frightening moment. people pushed, ran, and shouted, ducking and looking around. and then it was over as quickly as it started, with no explanation. we never heard a shot or figured out what triggered the sudden mass movement. i guess it wouldn't take much, though. brooklyn's festive labor day parade has been consistently marred by violence. 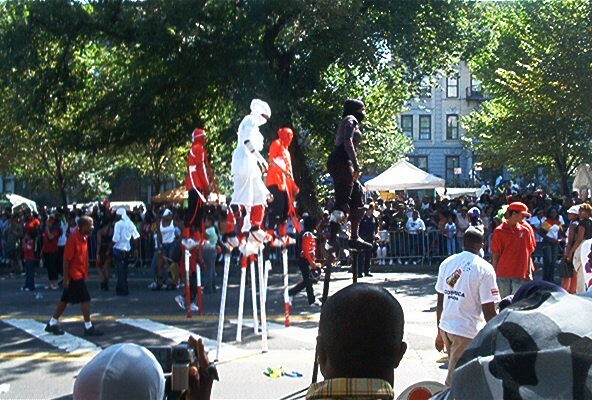 i heard later that someone was stabbed on monday, and learned as well that later that evening there was a shooting on flatbush ave. moreover, people in nyc and in the US more generally are pretty on-edge since 9/11, even if brooklyn's west indian festival seems a rather unlikely target. let's face it, despite all the wild but vague terror alerts raised by the bush administration, al qaeda had rather specific--and politically-pointed--targets when they struck three years ago: the world trade center, the pentagon, the white house. no surprises there. no surprise either to see anti-bush signs on the trucks going by: the president has done little to serve the caribbean community. 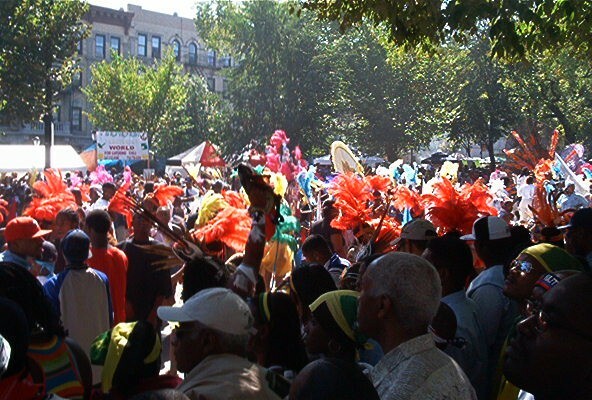 another contrast from last week's carnival in boston was the overall predominance of the jamaican presence in brooklyn. trinidad--who had the strongest showing back in cambridge--came in a close second, but there was no doubt--especially in the vicinity of massive b's massive soundsystem on wheels--that jamaica was represented to the fullest on this day. 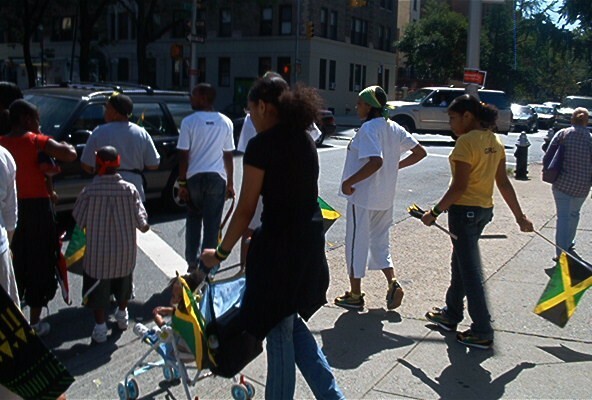 walking up flatbush ave on our way to grand army plaza, one could see more teams of proud jamaicans than any other bedecked group. i should note that there was also a substantial and impressive showing from guyana and panama--especially from the black/english/jamaican side--and several smaller islands, including st. vincent's, st. lucia, and st. kitts. most of the english-speaking islands were well-represented. there was a palpable, or at least visible, absence of spanish caribbean folk--especially on the road. of course, this is the "west indian" festival, which tends to mean anglo-caribbean (i.e., the islands formerly colonized by the british). ...I was scared shitless. The kind of fear when your Adam's apple swells up and seems liable to burst out your throat. So I did what most recently arrived Caribbean kids in that era would do in such a situation...I began talking with a Jamaican accent. "Wha ya deal wit? Mi nah wan no trouble, seen?" i think that explains pretty well, at least in part, why jamaican accents became such a common, if not crucial, aspect of new york hip-hop in the late eighties and early 90s. the fu-schnickens, the boot camp click (black moon, smif'n'wessun/cocoa brovaz, heltah skeltah, originoo gun clappas), biggie, busta, black star/mos def, and others give shape and form in their music to the west-indian-accented experience that life in brooklyn has become (and has been for some time). i need to get back soon to take in more sights and sounds and talk to more people about what brooklyn was like in the late 80s and early 90s. a good oral history of this period has yet to be compiled. somebody needs to give rebecca levine some dough so she can finish her project. i got a chance to chat with becca last weekend, and she definitely filled in some gaps for me in her description of the neighborhood and its parties circa 1983-1995.
even though i'm looking to see more, there were plenty of amazing sights to be seen in brooklyn last monday, including several groups dancing on stilts. unfortunately, the dance doesn't translate in a still photo, but here's a pic anyway. soon come back, brooklyn, y'ear?